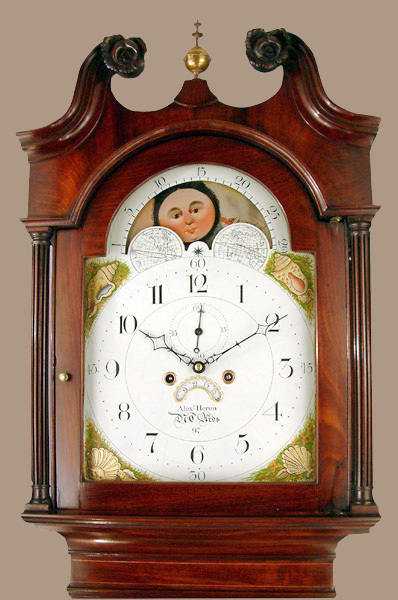 Alex Heron of Belfast Longcase Mahogany Circa 1825 - Height 86in. This Longcase Mahogany Archive's Maker - Alex' Heron of Newtownards. Near Belfast Northern Ireland.Recorded 1818 - 54. A good flame and figured mahogany case with carved paterae, swan neck pediment,quarter columns to trunk and shallow bracket feet. Medium length door. 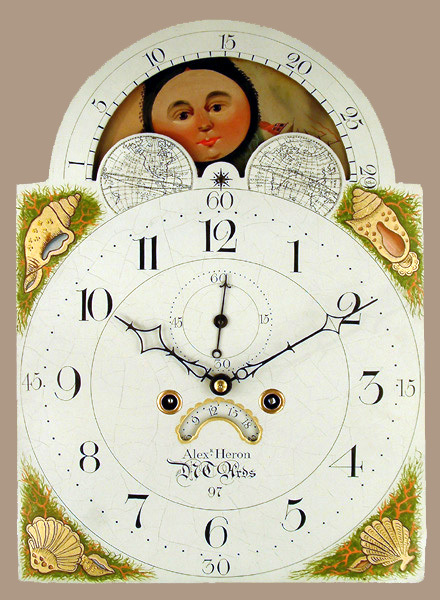 13" breakarch painted dial with subsidiary seconds dial, "sad mouth" date aperture moonphases to arch and seashell decorated corner spandrels. Marked no. 97. Alex' Heron of Newtownards. Near Belfast Northern Ireland.Recorded 1818 - 54. 86" ( 219 cms. ) or 85" ex. Finial.